David was the beloved son of Kathleen and Leslie Griffin, brother of Margaret, brother-in-law to Roger and uncle to Clare and Lynne. He was the adored husband of Anne and father to Stephen and Kathryn. A new and delighted grandfather to baby Tabitha and a fond father figure to Liza. He was a true friend to many and treated everyone with the same kindness and generosity of spirit he was renown for. He was born in the Somerset village of Winsham where the family historian, Maurice, discovered generations of his mother's family had lived for hundreds of years. Their family name was Loaring. It is said the name was derived from Lorraine in France and that their forefathers came over with William the Conqueror. There seems to be some truth in this as we discovered later. The first record of the name in the parish register of St Stephen's was a baptism in 1560. David was equally proud of his Welsh heritage and the fact that his father was from the the mining valleys of South Wales. As Les had a heart problem he could n ot go down the mines like everyone else and so he moved to Somerset to work instead where he met and married Kath. Dave loved a Welsh male voice choir and his favourite hymn was Cwn Rhondda; Bread of Heaven. The family were staunch chapel supporters at the United Reform Church opposite their home at Barrack Cottage, Fore Street. Dave was a clever lad who went to the village school and then onto Ilminster Grammar School. I remember Miss Harding telling me that he was the cleverest child she ever taught. Daisy Dalwood, on the other hand, used to pull up the leg of his trousers to slap him! He looked forward to meeting up with his friends from the grammar school at the annual Old Boys Reunion. When one of them brought in an Olympic Torch he had carried at the games and passed it around I thought that Dave was a true Olympian in many ways and an old boy the school could be proud of. He left there at 18 to take up a post as management trainee at the local lace factory and from there he went on to train with the firm in Nottingham. He played football and joined a local brass band who made a record we still have. His landlady was so fond of him that she cleaned his football boots for him every week! Sadly, Dave's father died prematurely of heart disease when Dave was only 21. He gave up work in the lace industry to return home and help support Kath and Margaret. I met him eight years later on a course run by the Institute of Purchasing and Supply. I said he couldn't miss me because there were only three women on this course and the other two were married. He said he noticed me straight away because I had dozed off and a light diffuser above my head had come loose and was dangling dangerously over me. He claims he said to himself, " That girl needs looking after" and he'd been doing that ever since. To win me over he sent me a bouquet of a dozen long stemmed red roses. Having succeeded, he never repeated the gesture! I moved down to Somerset from Liverpool and we married on 16 October 1982; a date that became unfortunately significant. My parents loved Dave and knew I would be in safe hands. We had our ups and downs including the tragic loss of our much loved and wanted baby girl Alice before birth to Edwards' syndrome. But, we never really had a row. It would have been like fighting with Bambi! Yet he was no push over. His old football team mates always said he would lose his rag, throw down his shin pads and chase after anyone he felt had not played the game. Years later, when he was a football referee, he had an altercation with a spectator who repeatedly challenged his decisions in the most ungentlemanly way. When he refused to shake hands and behave himself I am told Dave floored him. As he said later, "The referee is always right!". We had Stephen in 1986 in Taunton and Kathryn in 2000 in Poole. Dave used to say he had a Scouse wife, a Somerset son and a Dorset daughter. We all had an exceptional man of quiet strength of character in our lives. He was unfailingly decent in all of his dealings. He had a fine intellect, a keen sense of humour and a warm and sunny disposition. He was hard working, reliable and conscientious. In fact, I used to call him Saint Bloody David and I used to swear if the devil himself came along Dave would say he wasn't such a bad chap after all. He never had a bad word to say about anyone. When he took up teaching accountancy part time at the college students, many of them from the EU, would often come up to him when we were out to say hello and to thank him for being such a great teacher who had helped them on their way to a better future. He had many interests but he loved his sport, football, cricket and tennis and a game of skittles and a pint with his pals in Winsham when he lived there. We still have a tiny figurine he won at school as Victor Ludorum, of a golden haired boy running with a dog at his heels and a ball at his foot. The very image of Dave as a boy. 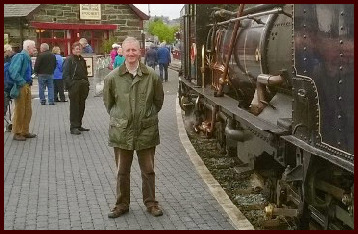 When I booked a training day for Dave a few years ago to learn how to drive a steam train,another great love of his, and two friends went with him I had to smile as I watched these middle-aged men looking as shiny faced and excited as three little school boys off on a great adventure. How they all adored it. He also loved brass bands, classical music, cruising, old cars and D.I.Y.. We bought an old, run down house he could work on as a retirement project. He could fix anything but he cannot mean our broken hearts. He waited until the month he was due to retire at Easter 2015 and his replacement had been appointed to take a day off sick. He was later diagnosed with pneumonia caused by the most aggressive form of Leukaemia; Acute Myeloid Leukaemia. As we did most things together, I was diagnosed with the most aggressive form of Breast Cancer; Inflammatory Breast Cancer at the same time. I always said our chances of winning the lottery would have been better. I had a radical mastectomy on 16 October 2015, our 33rd Wedding Anniversary. There is a photo of us both at the start of our chemotherapy as we both have our own hair although I thought I looked rather fetching in the wig I wore later! The battle was on and we were confident that Dave would pull through with a stem cell transplant if a donor could be found for him. He was well prepared for this by his haematologist at Bournemouth and pushed into remission with chemotherapy. Thanks to the work of the Antony Nolan Blood Cancer Charity at 2 Heathgate Place, 75-87 Agincourt Road, London, NW32 2NU, four donors were found for him. Interestingly, they were all German suggesting the family had originated in that region of Europe as Maurice had unravelled. 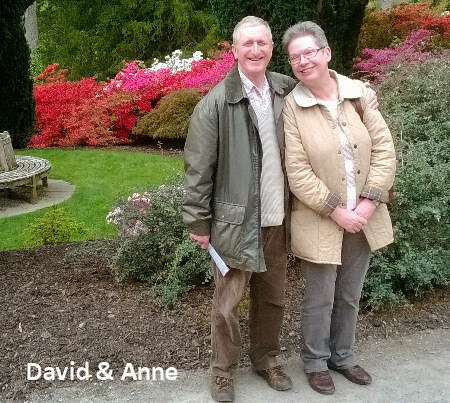 Thanks to the generosity of one German lady a perfect match for Dave was found and he had a stem cell transplant in February 2016 that was 100% successful. We decided that in recognition of this we would have to support Germany in the World Cup in future! With typical Dave toughness, he was out of hospital quicker than anyone else and well on the road to recovery. Although he had a successful stem cell transplant and remained in total remission from Leukaemia he began to deteriorate with a bowel problem and suffered horribly and heartrendingly because of that until his death. He had an operation to remove his colon in March this year and a stoma bag fitting which he despised. Things began to go downhill after that and I had to take him to St Mark's in Harrow after I was told in April he only had 1-2 months left to live. He made progress there but this October I had to take him back to A&E with a small bowel obstruction. A routine operation to repair an incarcerated hernia did not go well and, on the 16 October, our 35 Wedding Anniversary, he had a further operation to remove part of his small bowel too. He went into Intensive Care in a coma we were told later he would not recover from. An hour after we were told his life support would be withdrawn Dave opened his eyes and was able to breath on his own. He amazed his doctors who were equally embarrassed and delighted. One called him Lazarus and another said Dave had made a complete fool of him and wasn't it wonderful? It was but it was not to last and ended with his death on Sunday 3 December 2017 at 1:45 pm. It was a beautiful, sunny day with blue skies. But Dave did not die without ceremony. As I waited to see him in Intensive Care that bright sunny Sunday I heard a brass band playing. I went out into the corridor and the Salvation Army were there. Dave had only been to see them in a concert with his cousin Jane before he was readmitted to hospital. I explained tearfully to them where Dave was and how he had played in brass bands himself and I asked if they would play and pray for him which they did. Later on the hospital chaplain came in and said prayers with us for Dave and gave him a blessing. We had Cwm Rhondda recorded for Dave, as we had played all of his old favourites to him while he was in a coma, and we sang that for him though our tears. He died in my arms with Stephen and Kathryn at his side. Due to the circumstances and the events leading up to his death a post mortem has been carried out and an inquest will be held about June to establish the cause of death. We do not have a death certificate which has delayed arrangements for his funeral until now. Dave went through a terrible ordeal and so have we. Stephen and Liza also lost a pregnancy a month ago and we are all feeling overwhelmed. We do not wish to offend anyone and ask for your understanding but we have decided now that we can go ahead that we will have Dave cremated with just myself and the children in attendance at a woodland burial site tomorrow so that we can collect his ashes and bring him home for Christmas. Perhaps in the months to come we can celebrate his life instead of mourning his loss but now it is all too raw. And, I would rather give the Anthony Nolan charity a donation In Dave's memory that they can use to help other sufferers that will hopefully restore them to full health. If anyone would like to do the same please do so with our gratitude. I would also like to take the opportunity to thank everyone who made long and regular visits to see Dave over the past 3 years, often staying in hotels to save me extra work, and those who even went to St Marks in Harrow to lift his spirits. Friends from Brisbane turned up in Bournemouth expecting to see Dave after we left for Harrow and so they went right across London to see him there as well as ringing here regularly for an update on his condition like so many others. We have also had many lovely cards and messages of sympathy that have been a great comfort to us. One of my friends has said she will go to church tomorrow at 10 am and pray for Dave there. If anyone else has the time to pause and pray or just to remember the good times you may have shared with him I hope you will do so again, with our gratitude. I have put a few photos of Dave here so that you can see him again as we all remember him. He was rather special. Please pass this on to anyone else who knew Dave if you would like to that I may not have contact details for and I hope you all have a lovely Christmas and happiness and good health in the New Year.